Lower Farmland Values Ahead? What Would USDA Baseline Forecasts Mean for Farmland Values? Farmland values are highly dependent on expectations of the future earnings that a farm will generate. As commodity prices have fallen there has been considerable speculation about what will happen to farmland values. It is important to remember that it is not just current commodity prices that are important, but the earnings that will be received over many years in the future. In a previous post we examined the USDA Baseline corn price projections. In this post we will use that information to look at a hypothetical valuation of high quality Indiana farmland. The approach is to use the USDA baseline projection of prices, the variable costs, and yield trends to construct a measure of return over variable costs. Then, we calculate farmland values under various assumptions about the amount of the return over variable costs that flow to farmland. These amounts are then converted to farmland values with various capitalization rates. Specifically, we will look at the 1) USDA Ten-Year Baseline Forecasts, 2) Implications for Returns to High Quality Indiana Farmland, and 3) How Expected Returns Translate into Farmland Values. The USDA’s ten-year averages for corn prices, costs, yields, and returns over variable costs ($’s per bu) for each forecast period are shown in Figure 1. Each forecast year shows the average of the 10-year forecast. For example in 2010, the average of the next 10 years in the USDA baseline forecast for corn price was $3.72 per bushel with variable costs of $1.69 per bushel and a projected of returns over variable costs of $2.03 per bushel. Of particular interest in the case of farmland valuation is the forecast relationship between corn prices and variable costs because farmland will gather a substantial share of what is left after variable costs are paid. The 10 year forecasts estimated variable costs to fall between 41% (the 2007 10-year forecast) and 57% (the 2003 10-year forecast) of revenues. The actual variable cost experience over the period of 2003 to 2011 resulted in variable costs that averaged 46% of revenues (not shown in the graph). During the early part of the period, 2003-2005, the costs were higher averaging 55% and in the later part 2006-2011, they were lower at 42% of revenues. Figure 1. 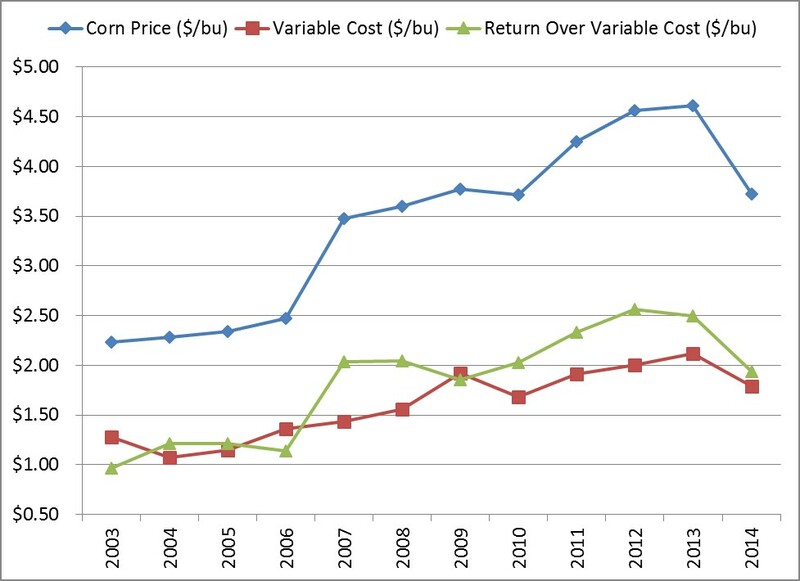 Average of the 10-Year USDA Long-Run Corn Price and Variable Cost Baseline Projections ($’s/BU), 2003-2014. After the variable costs of production are paid, what remains is a return to the fixed factors of production (equipment, unpaid labor and management, and farmland). How much of the return over variable costs farmland will receive is ultimately determined in the marketplace. A traditional 50-50 share rental arrangement typically split variable costs and revenues equally among the tenant and landowner. This means that the landowner received roughly half of the return over variable costs. However, the landowner also has to put additional money in to cover variable costs. One could argue about the appropriate split, so both a 50-50 and 60-40 landowner/tenant split was evaluated. Using the 10-year USDA baseline projections for prices and variable costs (from part 1) and the yield assumptions for high quality Indiana farmland it is possible to estimate the returns over variable costs. Figure 2 shows how these amounts have changed as the USDA baseline forecasts have changed. In this figure the blue bar represents the situation where 50% of the return over variable costs flows to farmland and the red shows a more optimistic (for the landowner) scenario where 60% of the returns over variable costs flow to farmland. Figure 2. The Amount Available to Land Under Alternative Return Over Variable Cost Capture Scenarios, 1.5% Yield Growth, High Quality Indiana Farmland. This chart shows that the amount of potential return to farmland has increased substantially over time. 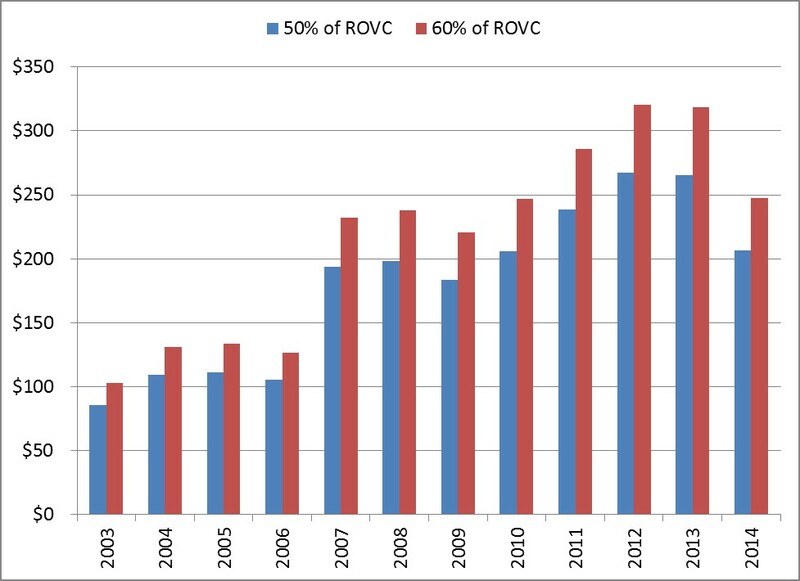 For instance, under the price and cost estimates in the 2003 baseline the 60% return over variable cost capture would have produced slightly over $100 per acre. By the 2012 projection, this would have resulted in an estimate of $320 per acre. The dramatic upward shift in income expectations is a very important part of the explanation for why farmland prices have increased so dramatically. Looking at 2014, the baseline forecast of the returns over variable costs have fallen from their peak. Today, capturing 60% of the return over variable costs would result in returns to farmland of slightly under $250 per acre and the 50% return-level would be roughly $200 per acre. Both levels remain substantially above (double) where they began in 2003, but keep in mind that farmland values have roughly tripled during that time period. So what do these expectations have to do with farmland values? When investors purchase farmland they are purchasing the rights to future earnings. Figure 3 shows estimates of what these farmland earnings would translate to when capitalized at a 3% and a 4.5% capitalization rates. The lower the capitalization rate results in higher farmland values so the top (blue) line in the graph results from applying a 3% capitalization rate (or multiplying the returns by 33). As a reference check with reality, I have also included a black line showing the value for high quality Indiana farmland reported in the Purdue Farmland Value Survey. The graph shows that heading into the early part of the period, farmland values reported in the survey were roughly in the middle of those implied by a 3% and 4.5% capitalization of the estimated returns over variable costs. Then, as the returns estimates increased the farmland survey values were actually below even the 4.5% capitalization rate line. 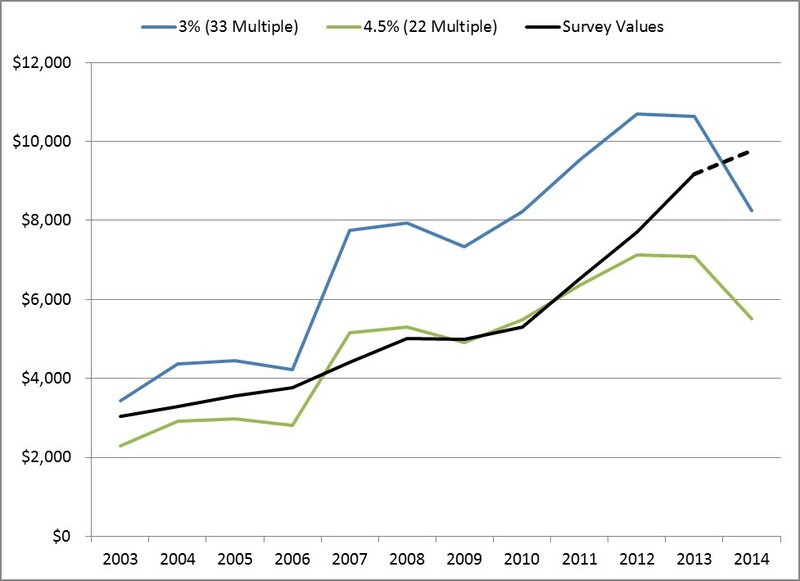 Eventually the survey values rose until they were again between the 3% and 4.5% capitalization rates in 2012. From 2003 to 2013, the survey values rose from $3,035 per acre to $9,765 per acre. Until the most recent downward adjustment of the baseline projections, the survey values were well below the 3% capitalization line. However, with the new, lower price projection they are now well above even the 3% line which stands at $8,256 per acre. Figure 3. High Quality Indiana Farmland Values with 60% Capture of the Return over Variable Costs from the USDA 10-Year Baseline Projections, 1.5% Annual Yield Growth and Alternative Capitalization Rates, 2003-2014. Today, the current prices for high quality Indiana farmland reported by Purdue’s Farmland Value Survey are above those calculated using the baseline forecasts and a 3% capitalization rate. This would indicate that either market participants are expecting greater returns than implied by the USDA baseline price forecasts or that they are willing to capitalize earnings at lower capitalization rate. Both scenarios are plausible. The USDA forecasts of long-range prices have not been particularly accurate. However, with prices now trading below the baseline projections it is becoming clear that if these prices hold for several years there will be pressure on farmland values to end their upward march and likely fall. When investors buy farmland they are bidding for the future earnings that they think farmland will generate. The estimates in Figure 2 and the price bands in Figure 3 are just theoretical examples of what these return estimates might be. In reality, the future is highly uncertain and these expectations will undoubtedly change again as the future unfolds. Additionally, the new farm program will provide some support for farmland values. However, one should watch farmland values closely in the coming years, and particularly if the current low commodity prices persist for several years.